Flashlights are still one of the most necessities today because of different purposes. Some people keep flashlights for emergencies, like when disaster strikes or a power outage strikes. The torches on your Smartphones won’t last that long and getting an actual one is essential. With the many torches, one of the best is Cree flashlights. We will all find out why later on in this article. With the many Cree flashlights today, it can be daunting to choose which one is perfect for you. They may all look the same, but they all have their differences that you, as a consumer should know about. I had round up the top 10 best Cree flashlights available on the market today and listed their pros and cons as well, so you can choose which one suits your needs. Get to know them one by one by reading the information provided just for you below. 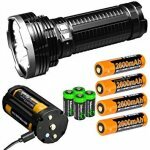 Below are the information on the best Cree flashlights, their features, and even their pros and cons so you’d know if you that is the Cree flashlight that you are looking for or not. The EdisonBright Fenix TK75 5100 flashlight is packed with four Cree hi-LED with 50,000 hours of life. You can enjoy six brightness levels, including SOS modes and strobe which you can use during emergencies and such. This flashlight has a lockout function and side switches so you can quickly turn it on and off. It also has a battery warning, which will let you know if the battery is already running low so you can charge it. This EdisonBright Fenix TK75 5100 flashlight is known to be anti-reflective and anti-abrasive, which means that this flashlight will also for an extended period of time. With its intense lighting, you can use this flashlight for illuminating a room, outdoor camping, and as well as emergencies. The Streamlight 88031 ProTac 2L is said to last for ten years. It has a high intensity of 260 lumens and a peak candela intensity of 5,600. Of course, it also has a low intensity, which will give you a candela between 13 to 300. It has sufficient power, light, and compact, which is perfect for law enforcement and emergency purposes. This Streamlight 88031 ProTac flashlight is waterproof and impact resistant. It also has a nylon-holster, removable pocket clip, and an anti-roll head. 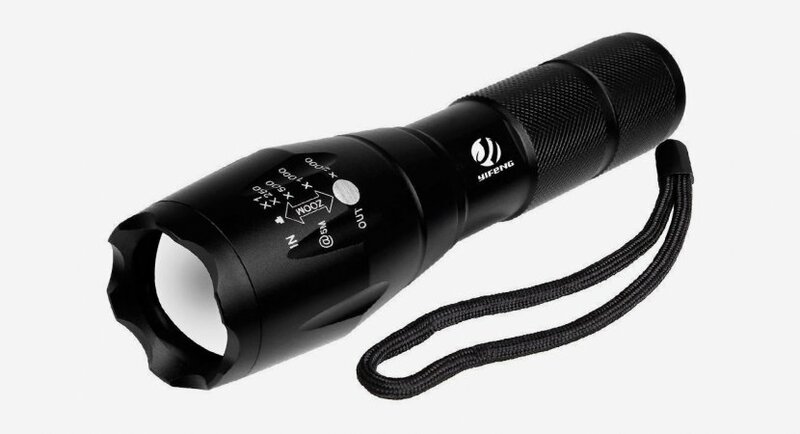 This flashlight weighs 2.8 ounces with batteries and measures 4.8 inches in length. The Comunite S31 has a zoom in a feature where you push the head to zoom in and out. This means that you can choose from a narrow beam to a wide beam. The flashlight has a maximum lumen output of 1200 and comes in three levels of brightness, including the strobe, medium, and high. At the tail is where you can find the on and off button. One of the best things about the Comunite S31 is that it has a total length of 7 inches when you zoom it out. It only weighs 272 grams, which makes this light in weight. Also, the flashlight is powered by either three double A batteries or 3.7V 26650 battery. It is perfect for self-defense because of the double flower heads that it has. Lastly, this flashlight is weatherproof and withstand scratches and beatings. The Fenix TK35 High Performance 860 lumen flashlight can throw a total of 860 lumens with a maximum of 170 hours runtime. 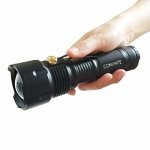 This flashlight is perfect for personal purposes because of its size and how it can hold the light for hours, especially when emergencies come. One of the best things about this flashlight is that it is durable wherein it can withstand any weather conditions. The reason behind this is because it is made out of hard anodized finish and aircraft-grade aluminum. The lens is made out of a sturdy glass and is resistant to wear. Another good thing about the Fenix TK35 flashlight is that it has an anti-slip, which means that you can place it on a flat surface. This means that you can free your hands. It also has a memory mode, so when you turn it on, it will immediately go to the last lighting mode that you used. The Simon Cree LED Flashlight is perfect for hunters, campers, and as well as law enforcement. You can easily hold and use this to mount on a weapon, or you can also use this to blind the assailants. The frame is made out of aircraft-grade aluminum and to add to its aesthetics an anodized is added. This flashlight weighs 8 ounce which means that you can carry this anywhere with you. One of the best things about this flashlight is that it has sixteen different settings to help widen the beam, tighten it and focus. There are five different brightness levels, including strobe, SOS, low, medium, and high. It has a total of 500 lumens and can last up to six hours depending on the setting that you’re going to use. The Streamlight 88060 is a small flashlight which is perfect for law-enforcement, camping, and hiking. The construction is made out of an aluminum case, which makes it resistant to water and dust damage. It is equipped with a LED bulb, which means that it can produce a bright light. The flashlight can be powered by CR123A batteries or 18650 Li-ion rechargeable batteries. One of the best things about this Streamlight 88060 is that it has a total of 2,200 lumens and the beam can reach a distance of up to 346 meters. The flashlight can last for a minimum of 1.75 hours but can also last for as much as 43 hours depending on the setting used. The SureFire P3X Fury can be carried on a pistol or on your belt. It only weighs a total of 10 ounces and measures 10 inches long. 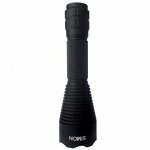 You can grip this flashlight easily because of the knurled design that it has, which is perfect during cold or wet climates. Turning the flashlight will be a breeze because the switch is just at the tailcap. This will also prevent the light from being turned on even if it’s stored in your pocket or belt. This flashlight can illuminate a total of 1,000 lumens where the beam can be adjusted according to your environment. The compactness and durability that this has will surely be worth it. The ETPower 1800 has a CREE XM-L T6 LED, which means that it has the performance and the battery life that you need. This flashlight is made out of aluminum allow for extra sturdiness and durability. It is also waterproof, which means that this flashlight is perfect to be used outdoors no matter what the weather condition is. One of the best things about the ETPower is that it has internal wiring to help boost the efficiency of the flashlight. Another good thing about this flashlight is that it has a zoom in and out function, so you can check objects from afar. The Fenix PD35TAC flashlight has a lifespan of 50,000 hours and a total lumen of 1,000. It is compact and lightweight which means that you can bring the flashlight anywhere you, please. It has an IPX-8 rating and can be submerged in a 6 and a half meter of water for half an hour. The battery life, on the other hand, is known to be long lasting which of course will depend on the setting that you will choose. Lastly, you will see when you need your battery to be recharged because the Fenix PD35 has a battery indicator. The 1TAC TC1200 Pro flashlight is one of the most compact and robust flashlight today, wherein law-enforcement trust this flashlight. 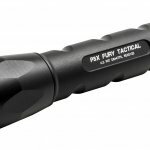 This flashlight is made durable because of the aircraft grade aluminum that it has. The base is magnetic, which means that you can attach it to any metal and use both your hands to work. This 1TAC TC1200 comes with four different modes, including strobe, low, and high. It is powered by double A batteries, but you also have the option to choose rechargeable ones. With its 1200 lumen, you will surely be able to see what’s ahead of you. Lastly, the beam can reach a distance of up to two miles. Cree flashlight is known as a high brightness light emitting diode, which is manufactured by Cree Inc. and is known as a US company. This kind of torch is usually made out of machined aluminum to ensure that it will maintain its strength. 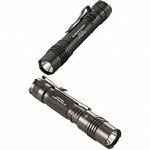 CREE flashlights are perfect for people who are looking for a strong beam range and portability. Since the innovation of technology today, there has been an improvement when it comes to the light output, runtime, and as well as the battery efficiency. Cree flashlights use a rechargeable 18650 Li-ion battery, which means that it provides enough power and brightness compared to other batteries. Though there are still disposable batteries that can be used using a Cree flashlight, it will always be up to the user as to what kind of battery you want to use for your Cree flashlights. The first thing that you need to do is to know why you need the CREE flashlight. You need to ask yourself as to what you’re planning to do with the light — knowing where and how you’re going to use it. Once you have answered all of these questions, you’ll see the kind of CREE light that you are looking for. You will also see the weight and the size that you need to work on your tasks. When purchasing something, it is ideal to know your budget so you won’t have to overspend when buying something that you need. Cree flashlights are available in a wide variety of prices. There are cheaper ones, but there are also ones that are expensive. Always put in mind that you will get what you pay for. Avoid purchasing cheap Cree flashlights, but you don’t even have to spend something that is too expensive. The next thing that you need to know is to figure out the brightness that you want your Cree flashlight you need to be. Remember that the brightness will be measured in lumens and the kind of brightness will depend on how you’re going to use your flashlight. The distance is also important so you should take this into consideration. You can find the product specification of the distance and brightness of the flashlight on the packaging. When purchasing a Cree flashlight, you need to check as to how many LEDs are actually being used. There are flashlights that have multiple LEDs, but this will not mean that it will be bright. Typically they will give you a more focused beam. Majority of high-quality flashlights have a single LED, and they all offer more brightness and good beam shape. Go to the store and check the LED physically, so you know the actual shape of the beam. You also need to know the materials use when it comes to the Cree flashlight that you are going to purchase. If you are looking for a lightweight, then you need to opt for one that is made out of plastic. But plastic ones are not durable, which means that you might end up purchasing another one in the near future. If you want something that is durable and something that can withstand weather and impact, then an aircraft grade aluminum would be best. Lastly, you also need to check the batteries that the Cree flashlight will use. Most Cree flashlights have disposable batteries. But there are some Cree flashlights that are compatible with rechargeable batteries. Opt for batteries that are efficient. Put in mind that the dispersion of light from the flashlight’s lens is also important. For example, using a flashlight that has a fixed beam is ideal for outdoor use. The spot beams are perfect if you’re using the flashlight to search for something. Majority of the Cree flashlights have an adjustable beam which will depend on your intended use. Beam distance is the point where the intensity of the light dimities and drops. It would be best to choose a Cree flashlight that has a total illumination of 300 to a maximum of 500 meters. If you are planning to use the flashlight outdoors, it would be best to choose a Cree flashlight that can give you a full moon illumination. The reason behind this is because it is known as the safest beam for outdoor use and when you’re traveling. The light’s output can differ from 50 to over 3,000 lumens. 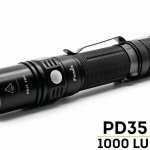 This will usually depend on the manufacturer of the flashlight that you are purchasing. Cree flashlights usually have different settings for its light, wherein you have the power to control the brightness. This will help you to get proper lighting based on the situation that you are in. You need to know how much time will it take before the flashlight starts to drop by 10%. As you all know, the output of light can decrease over time, and when an emergency strikes, you surely need to have a light that can help you. There are Cree flashlights that have a total runtime of a couple of hours and more. The life hours can range from 50,000 to 100,000 hours. When it comes to flashlights, the battery type will play a major role. There are three different types of batteries available, which are the renewable, rechargeable, and disposable ones. For Cree flashlights, it would be best to use rechargeable lithium batteries are perfect. The reason behind it because you can easily connect the flashlight through the USB cable so you can charge it. For people who don’t know, there are many models of flashlights, and they come with different modes, including SOS, strobe, low, medium, and high. The modes are perfect if you want to ensure that you are saving your battery in case of an emergency. This is also perfect if you want to avoid the predators’ attention. The modes of the flashlights are often a fixed feature on the flashlight itself. With Cree flashlights, modifications and mode updates can be done using a computer and a USB cable. A good Cree flashlight has a durable construction to make sure that it will work no matter what the situation is. Also, this kind of flashlight should also be resistant to impact. You can use your flashlight during rainy weather since you’re going to choose a durable flashlight that’s water resistant. Just make sure to choose an IPX rating that suits your needs when purchasing a flashlight. You also need to check if the manufacturers have complied with the standards when it comes to making flashlights. The functionality should be acceptable to the public, and every product should be regulated and tested before they become available in the market. Of course, you also need to purchase a Cree light that is portable enough that you can bring it anywhere with you. 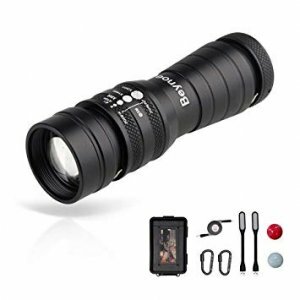 This is ideal especially for people who are always on the go or are planning to bring their flashlights during campings or huntings. The weight and size of the flashlight are important especially if you don’t intend to use this for emergency purposes. With the many Cree flashlights in the market, it can be challenging to find one that is perfect for your needs. The information above will help you understand everything that there is when it comes to finding a Cree flashlight that will match the needs that you have. Always remember that you should not always just rely on the features of the flashlights, but your personal needs and as well as preferences. 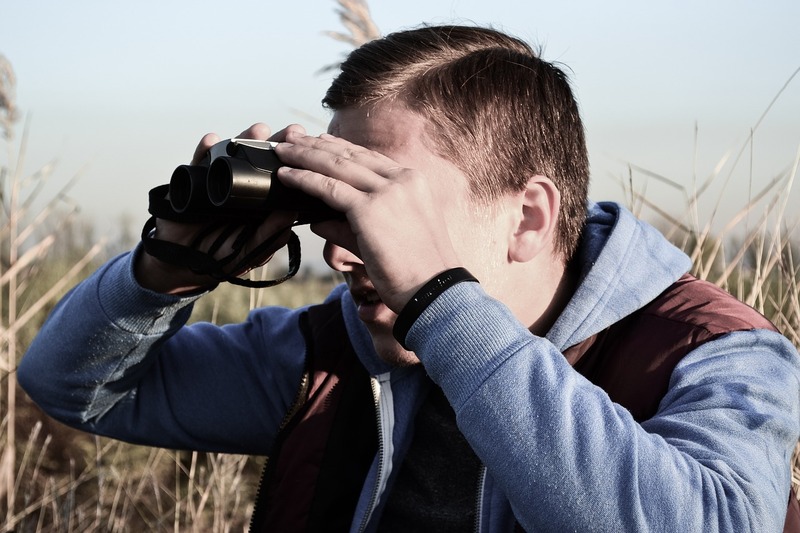 Start deciding on which Cree flashlight to get from the list above so you can start using it for emergency purposes or even for camping or hunting.